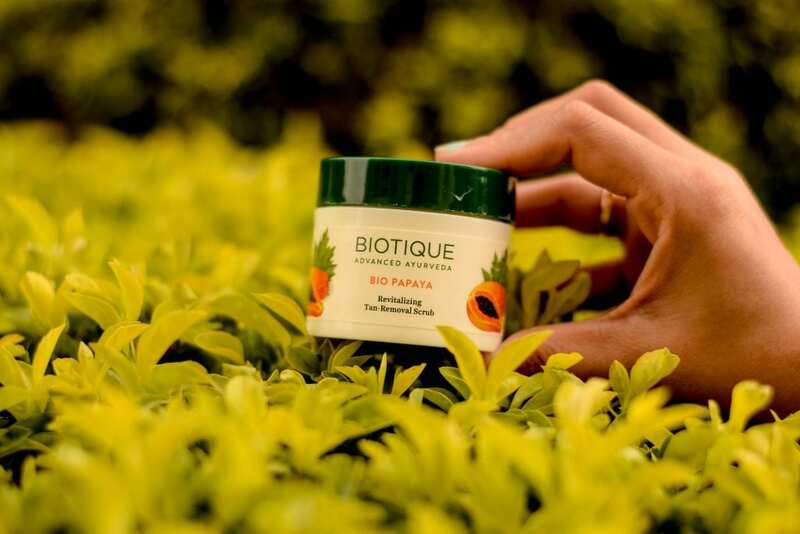 Biotique – The goodness of Ayurveda & efficacious ingredients for your skin and hair. 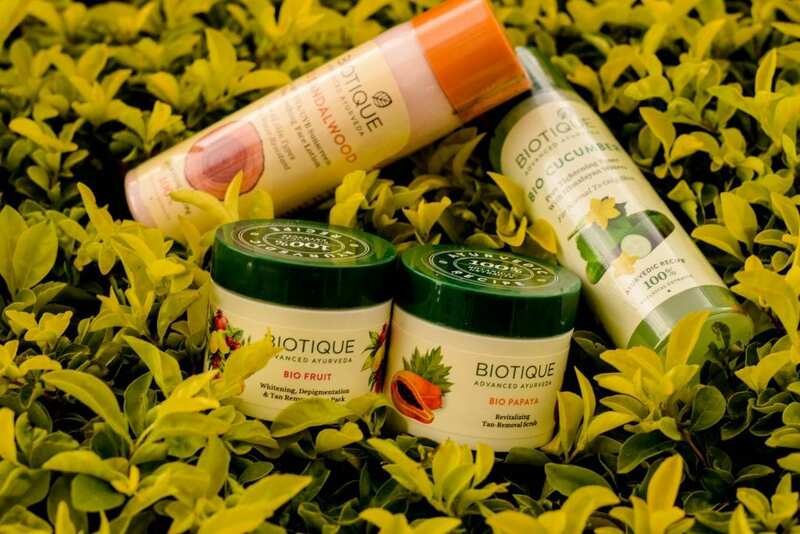 Biotique is a renowned brand in skin and hair care line which is known for its 100% natural botanicals, No chemicals products. The incredible blend of Ayurveda with advanced Swiss biotechnology has made it one of the prominent brand in the beauty industry. They have a wide range of beauty and hair care products which are preservatives free, dermatologically tested and no animal testing. Moreover, all the products are in eco-friendly and recyclable packaging which makes it different from other brands. I have been using some of their products for a long while and they have become part of my daily skincare regime. So today I decided to share with you guys my top 4 products from biotique that I think are the best herbal products for anyone … So let’s get started. When I talk about my daily skin care regime, exfoliating is the most essential step for me. Exfoliation is the process of eliminating dry and lifeless skin cells so the new skin cells can come to the surface. Exfoliation also helps in increasing blood circulation which is the key to a healthy glowing skin. Selecting the right exfoliator can be a problematic task. I have a very sensitive skin and the moment I get out in the sun I get tanned. So removing tan and attaining even tone is the prime concern for me. I have been using Biotique Bio products for a very long time and I am very much satisfied. I cannot think of any other scrub when it comes to removing tan. So let’s quickly get into the details! This Revitalizing Tan-Removal scrub is blended with pure papaya fruit to dissolve dead surface cells, unclog pore openings and smooth the way for clear skin to the surface. Gentle refining action uncovers skin’s natural brightness for a younger-looking complexion. Talking about the main ingredient papaya, which is rich in vitamin A and C and a special enzyme called papain that removes tan and great for skin lightening. I really love this scrub because this is the only exfoliating product which has worked great for my skin. The product comes in a white color solid plastic tub with twist cap and inside a separate lid which prevents it from spillage. The texture is very creamy and thick since it’s a clay-based product which is great for absorbing the excess sebum thus it is great for acne-prone skin. The smell is very refreshing and the scrubbing particles are perfect in size and not very hard on the skin but the only advice I would like to give here is, be very gentle while massaging your skin. Overall a great product for exfoliating and other skin issues like blackheads whiteheads and uneven tone. I highly recommend this product, do give it try I promise you wouldn’t be dissatisfied. The main ingredient cucumber made me try this product. Cucumber contains silica and other antioxidants which helps in rejuvenating the skin. After using this toner I could see the difference instantly on my face. It not only tightness the pores but also cleanses for a refreshing look. If you have a sticky skin especially oily and combination then it’s a great toner to try. 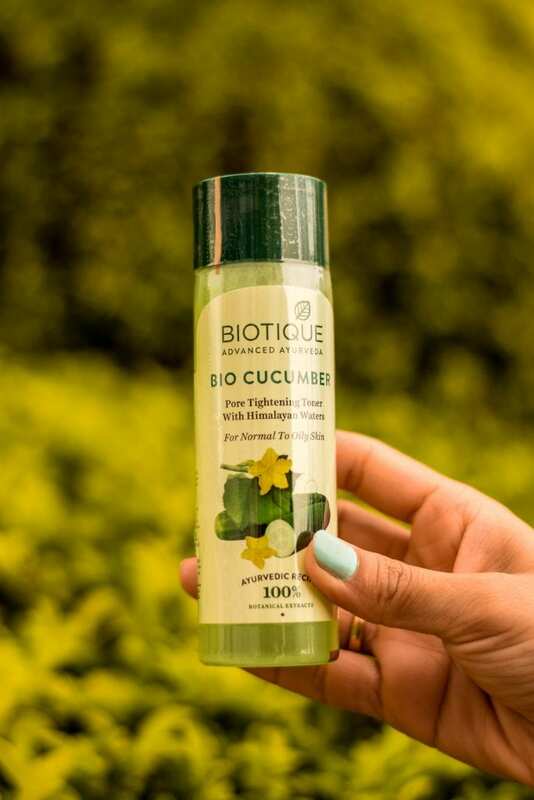 The product comes in a translucent Biotique cylindrical bottle with their patent green screw cap. The hole in the stopper to dispense the toner makes it very easy to use. The only problem for me is that it has a strong astringent smell but that’s completely bearable as long as it’s doing the job. I am really happy with this product and defiantly recommend this product. As I mentioned earlier in this post that I have very sensitive skin and I get tanned very easily then you all can imagine how important a sunscreen is for me. I would like you all to notice here that the SPF refers to the capacity of a sunscreen to block UVB rays that can cause sunburns, as well as UVA rays, that can cause deeper skin damage. Higher the SPF number, the higher the protection. Daily use of sunscreen may lower the risk of skin cancer and early signs of aging and especially in a country like India protecting your skin from sun damages is very important. This nutrient-rich lotion is blended with pure sandalwood, saffron, wheat germ, honey and bark of the Arjun tree to keep skin soft, fair and moisturized. Protects skin with broad spectrum SPF 50 UVA/UVB sunscreen. Very water resistant retains SPF after 80 minutes in the water. We just cannot deny the importance of wearing a good sunscreen in the summer to evade suntan and other skin damages. How much can sun’s ultraviolet, or UV rays be harmful is a very serious question. 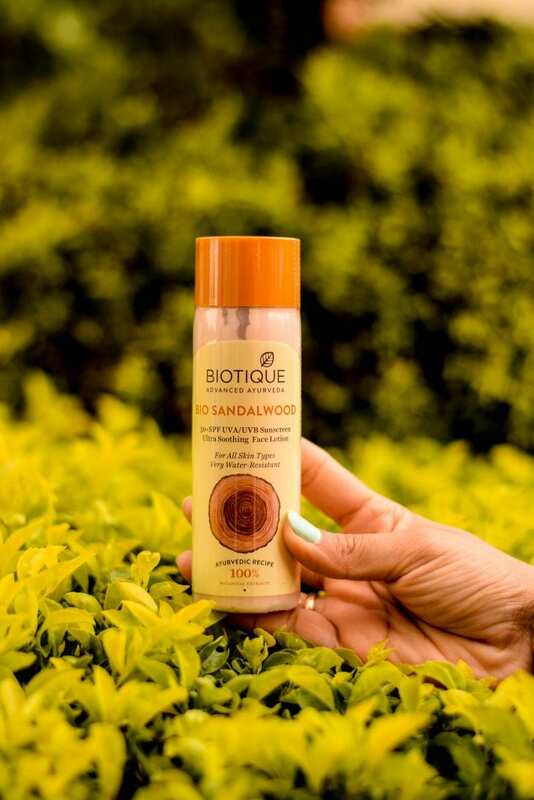 Finding a perfect sunscreen for your face can be a challenge because most of the sunscreen is too greasy to apply on the face but thanks to biotique it’s neither too thick nor too thin. The product comes in typical Biotique bottle packaging with a yellow screw cap. I am totally in love with all the potentials of this product from its texture, ivory color, and amazing sandalwood smell and of course the efficiency of the product. The product absorbs into your skin within seconds. Very light on the skin and the Broad spectrum sun protection with high SPF-50.+ provides a good protection for up to 3 hours but then make sure you reapply it. And if you are a beach person like me then this non-greasy water resistant will work perfectly for you. An impeccable sunblock. Go for it without any hesitation. Everyone wants a spotless, shining, beautiful skin, but no one has time to make the messy time taking home remedies. The climate is causing many problems like pimples, pigmentation, acne, dark spots on the face. And after using a lot of depigmentation face pack, I discovered a perfect face pack for improvement of my skin tone and that is Biotqiues Fruit Whitening and Depigmentation Face Pack. So if you are also looking for an instant remedy for getting a lighter skin Complexion then keep on reading. 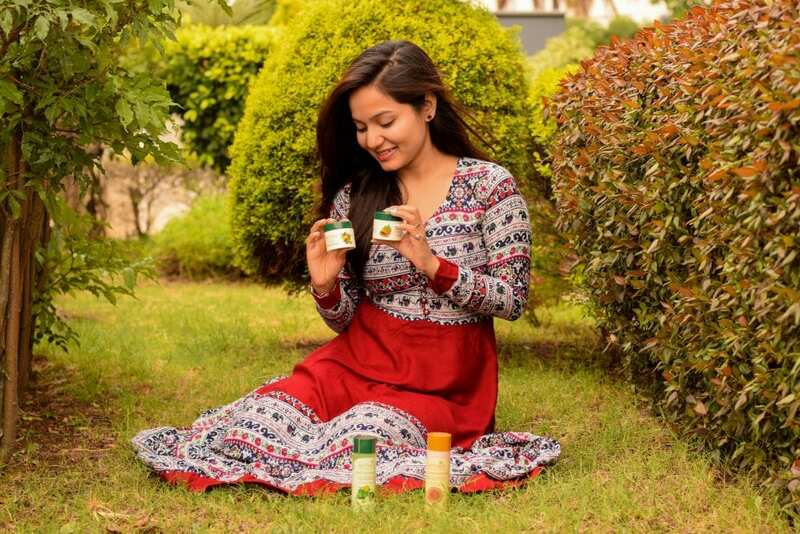 The key ingredients of this product especially multani mitti is known for its several benefits like fighting pimples, black spots, skin healing, improving skin complexion, and many more. My skin always gets tanned as I step outside in the sun. After trying so many products I got to know about this product from my sister and honestly when the very first time I applied this mask on my face. I love how effectively it hydrates your skin, leaving it soft and supple. I already have a fair complexion and I don’t need any whitening or depigmentation but yes one thing I expect from any depigmentation face mask is skin color correction and this product has met my expectations. The product comes in a white color solid plastic tub with again their patent green cap and inside a separate lid which prevents it from spillage. The color is brick red and has a thick creamy consistency which makes it little messy to apply on the face. Make sure you add some water or rose water to it to make it little smoother. Apply it daily for better results and be patient because nothing works overnight. I would definitely recommend this pack to improve skin complexion. So those are some of my basics skincare routines. 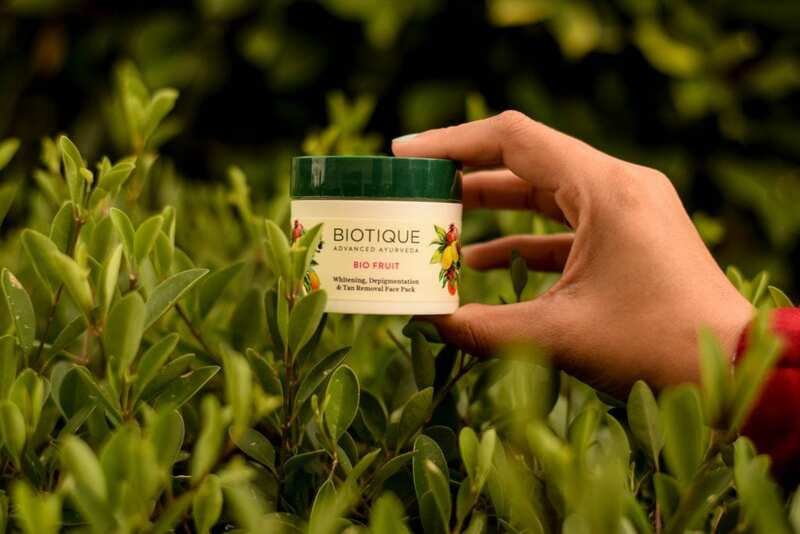 Biotique has been one of the most trusted brand for me because I like to keep myself positive through embracing nature and its beauty. I hope this is useful. Let me know if you have any questions. Till then stay happy, stay beautiful. Next Post Meander in the Mist – Shola Crown – Resort amidst the misty mountains. Pingback: Meander in the Mist - Shola Crown - Resort amidst the misty mountains.